Save on your next flight from AMA to VLC when you book through Travelocity. Need a last-minute flight to Valencia? Travelocity offers discount airfare no matter when you book, even on popular routes such as Rick Husband Amarillo Intl. Airport to Valencia Airport. Whether you need a direct or indirect flight, you can trust Travelocity to provide you with the best prices for AMA to VLC flights. Top Flights to Rick Husband Amarillo Intl. Explore Valencia with Travelocity's Travel Guides to find the best flights, cars, vacation packages and more! Located in the heart of Manises, this hotel is within 6 mi (10 km) of Turia Gardens, Bioparc Valencia Zoo, and Valencia Conference Centre. Valencia History Museum and Feria Valencia are also within 6 mi (10 km). Rosas Station is only a 2-minute walk and Manises Station is 9 minutes. 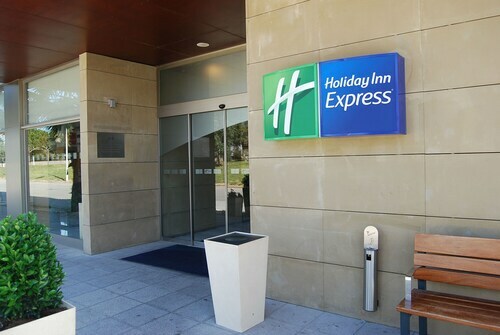 Situated near the airport, this hotel is within 6 mi (10 km) of Feria Valencia, Bioparc Valencia Zoo, and Valencia Conference Centre. Turia Gardens and Valencia History Museum are also within 6 mi (10 km). Rosas Station is 8 minutes by foot and Manises Station is 13 minutes. Situated near the airport, this hotel is 2.8 mi (4.5 km) from Diverbol and within 6 mi (10 km) of Manises Municipal Pottery Museum and Cabecera Park. Valencia History Museum and Bioparc Valencia Zoo are also within 6 mi (10 km). Situated near the airport, this hotel is 0.2 mi (0.4 km) from Centro Comercial Bonaire Aldaia and within 6 mi (10 km) of Bioparc Valencia Zoo and Turia Gardens. Valencia History Museum and Sports-Cultural Complex Petxina are also within 6 mi (10 km).